Salford Museum and Art Gallery was the UK’s ‘first free public library’, which opened in January 1850, followed in November by a museum and art gallery. The building was a mansion house known as Lark Hill, which had been built in the 1790s and has given its name to the Museum’s famous Lark Hill Place – a Victorian street within the museum. The Art Gallery houses a permanent display in the Victorian Gallery that has recently been re-hung and now contains over a 100 works of art exhibited in the style of Victorian gallery. The entire gallery has been repainted and new interpretations added to help visitors to enjoy and engage with the pieces on show. Pre-1900 Continental European oil paintings in Salford Museum’s collection can be searched by visiting VADS – the online resource for visual arts. The Gallery offer some permanent exhibitions. Victorian Gallery includes paintings, decorative art and fine art. From the re-decoration and re-hanging of Victorian artworks, the gallery now includes all the old favourites previously on display, as well as works from its stores. In keeping with the Victorian museum experience it also displays all sorts of objects in cabinets of curiosity – showcasing some of the weird and wonderful things its Victorian museum curators collected. All of the Gallery’s oil paintings can be viewed online on the BBC Your Paintings website. Pilkington’s Gallery – In the early 20th century, a local firm, Pilkington’s, based at Clifton Junction near Swinton, Salford was one of the most important international suppliers of high quality decorative tiles and art pottery. Their products were stylish, desirable and expensive, perfect for furnishing fashionable middle-class homes. Pilkington’s success was due to superior design combined with technical expertise and good publicity. 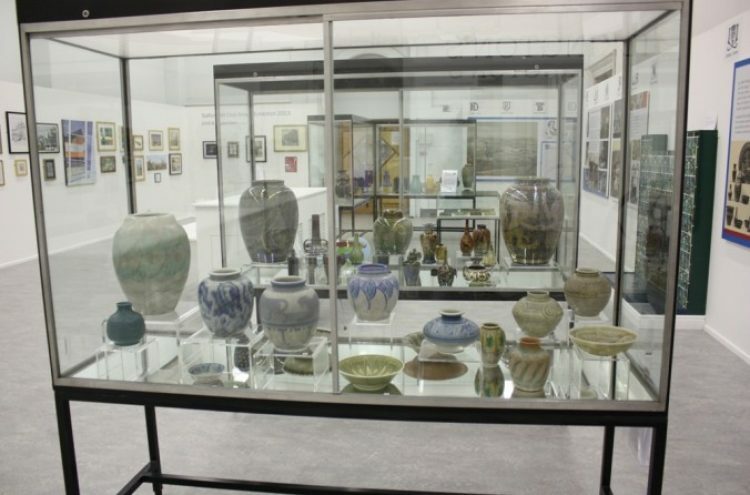 In 1904, when pottery production in the Art Nouveau style began, Pilkington’s started to rival known ceramic names like Minton, Bernard Moore, Doulton and Maw & Co.
Salford Museum’s Pilkington collection is the largest in the UK. It contains examples of almost every artist and most types of ware produced by the factory between 1900-1958 and the 1970s. When the company unfortunately closed in June 2010 Salford Museum was able to acquire the Pilkington archive containing pattern books, notebooks and company documents. This important resource not only compliments the ceramic collection but also assists by placing it in its social history context. The Gallery also displays a number of temporary exhibitions throughout the year. Please see separate posts.